Sometimes I get lucky. 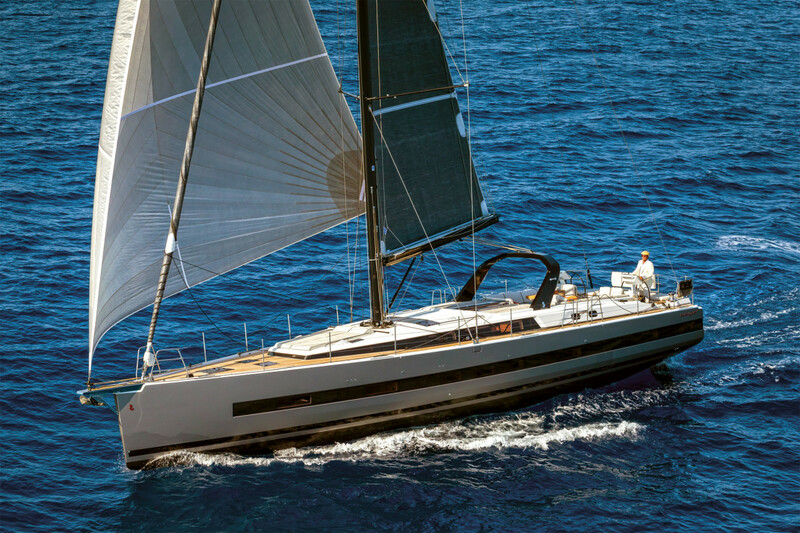 When I stepped aboard Beneteau’s new flagship, I was the first journalist (from anywhere) to examine and sail hull #1 of the new “Oceanis Yacht” line. 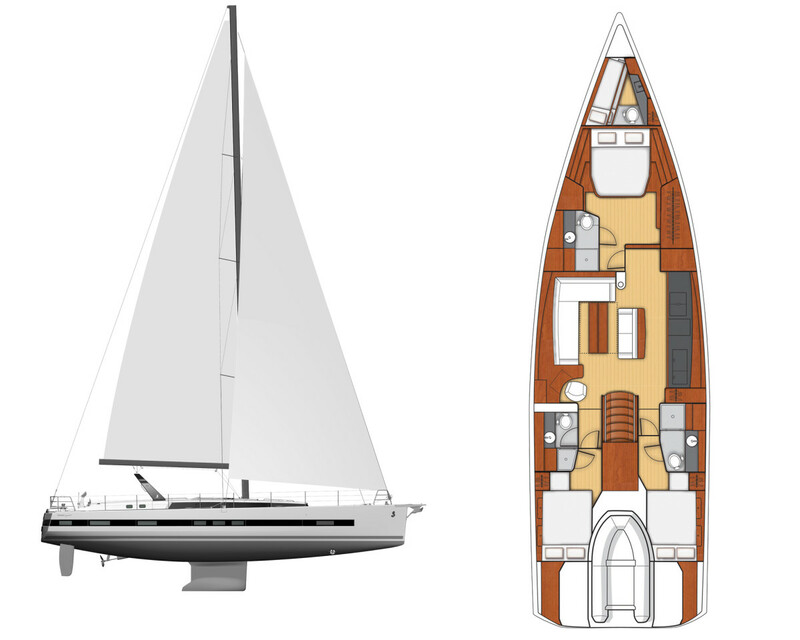 The word “yacht” has been added to designate Oceanis models 60ft and over. It’s a bold new direction for the French builder, which is now reaching beyond pure production boats to luxury-oriented mini-superyachts. The design firm of Berret Racoupeau, a longtime Beneteau collaborator, drew this model from scratch. 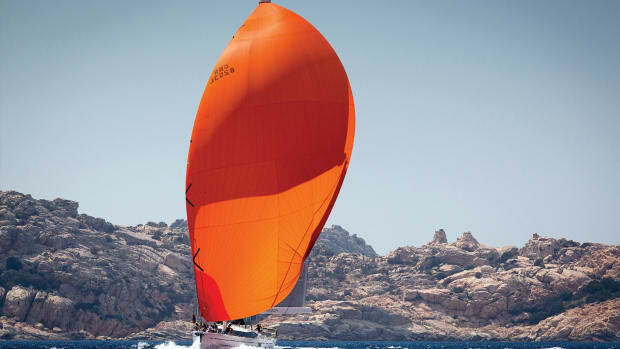 Beneteau then leveraged its relationship with Pierreangelo Adreani (who has worked extensively on the company’s powerboats) to add some aesthetic touches. The resulting boat is sleek, with a profile accented by a black hull stripe that hides a dozen dark windows. The high topsides permit a low-profile coachroof that does not impinge upon the volume and headroom belowdecks. Even the 30in lifelines don’t make the model look particularly tall at the dock. As a side note, I’m happy to see the return of functional lifelines on an offshore vessel. It’s a nod to safety that I hope other builders will emulate. 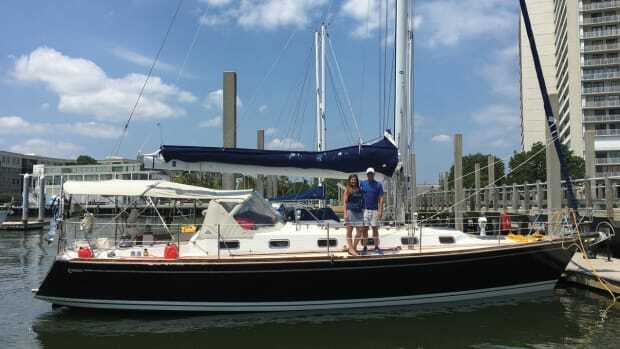 The tapered 9/10 fractional deck-stepped Sparcraft mast towers over the deck with an air draft of 90ft. 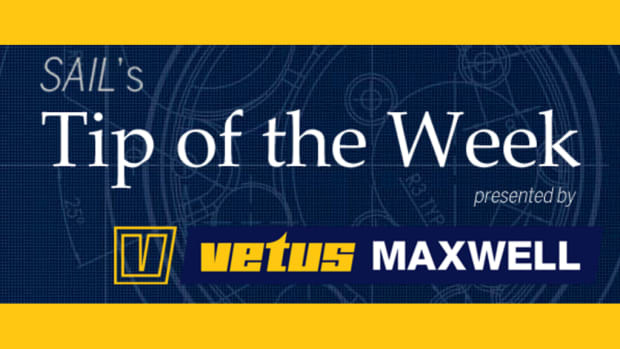 With the 105 percent genoa, the total sail area with an in-mast furling main is 1,959ft2. A 2,600ft2 Code 0 is also available as an option. The massive sailplan is managed by four electric Harken winches aft, near the helms. The Code 0 attaches on the integrated stainless steel bowsprit. It’s large and helps to hold the anchor away from the plumb bow, but isn’t obtrusive and melds nicely into the overall hull shape. 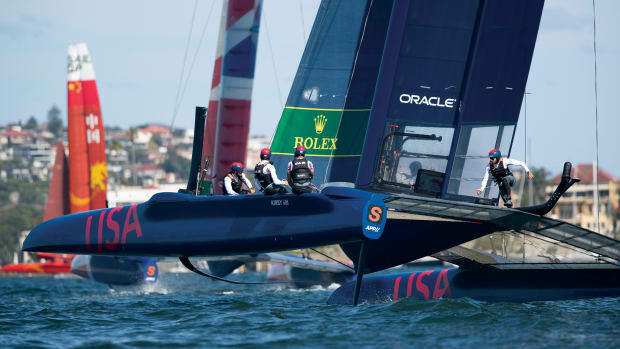 A sun pad dominates the foredeck. It is one of six such areas aboard. Loungers rejoice! At the other end, the transom drops down electrically to form a large swim platform, which at first blush is not that different from those on the company’s other designs. However, in truth, Beneteau has very much stepped up its game here in that the platform drops below the water at the aft end to make it much easier to launch and load the tender (specified as a Williams 2.85 jet boat, although another inflatable dinghy can also be used). A Quick electric winch hauls the dink into the garage where there is also an electric pump to inflate/deflate it. Along these same lines, instead of a scary ladder, the OY 62 has civilized staircases port and starboard, which lead down from the cockpit and can be easily managed by kids or anyone else who may be a bit less agile. Forward of the swim step, twin superyacht-style command pods hold a pair of Carbonautica wheels, toggles for the Quick bow and stern thrusters, a remote control for the Quick 24V windlass and B&G Zeus 12in multifunction displays (upgradable to 16in NSO B&G MFDs). Switches to furl and unfurl the headsail on a Facnor furler can also be found here to make sure that you exercise very little more than your fingertips when setting sail. Forward of the helms, the social cockpit includes a U-shaped settee to either side wrapping around a pair of adjustable-height tables. When these are lowered they become lounges, separated by a walkthrough passageway to the companionway. 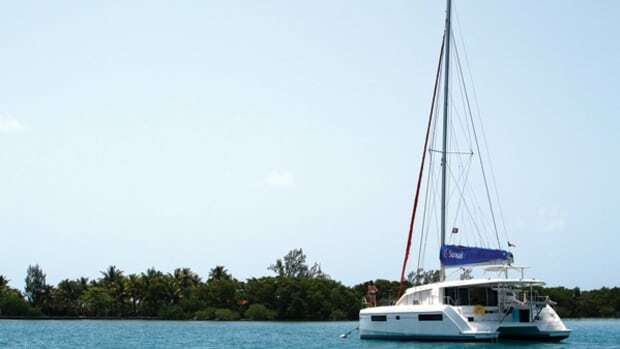 An electrically activated module with a grill, sink, prep station and pop-up light is hidden below the transom deck under the aft sun pad, and a rigid bimini is available as an option. Although I’ve only seen drawings, at first glance this really adds to the lines of the boat. Comprised of a black fiberglass roof with an integrated windshield, it also includes a handhold along the aft edge that will make the transition from helm to helm a bit easier in rough conditions. Belowdecks, the saloon features a portside L-shaped lounge facing a centerline settee with an adjustable table in between. To starboard is a straight-line galley, separated from the saloon by a console that also holds a pop-up flat screen TV and a bottle holder. The galley on our test boat was packed with a combination of standard and optional features, including a three-burner Eno stove/oven, a microwave, Vitrifrigo top and side-loading refrigeration, an Isotherm icemaker, a Dometic wine cooler, an Edesta dishwasher and twin sinks. At first glance you see none of this, though, as it’s all hidden beneath gray Corian countertops or behind mahogany Alpi cabinetry with overhead lockers finished in a shiny white lacquer. The forward-facing navigation desk is to port and close to the companionway for easy communication with the cockpit. A third B&G plotter, a Schreiber digital bus panel and USB charging plugs surround the large L-shaped desk, which also includes an integrated laptop space. The master stateroom forward benefits from a foyer that adds a bit of privacy for the owner, since you cannot see into the cabin from the saloon due to the winding corridor that leads to it. There’s also a place for an optional Splendide washer/dryer combo and a large pantry. A built-in bookcase is located forward of the padded tower that hides the compression post, while to starboard of the entrance is an area that on hull #1 was configured as a chest of drawers, but can also be a desk or a short sofa. 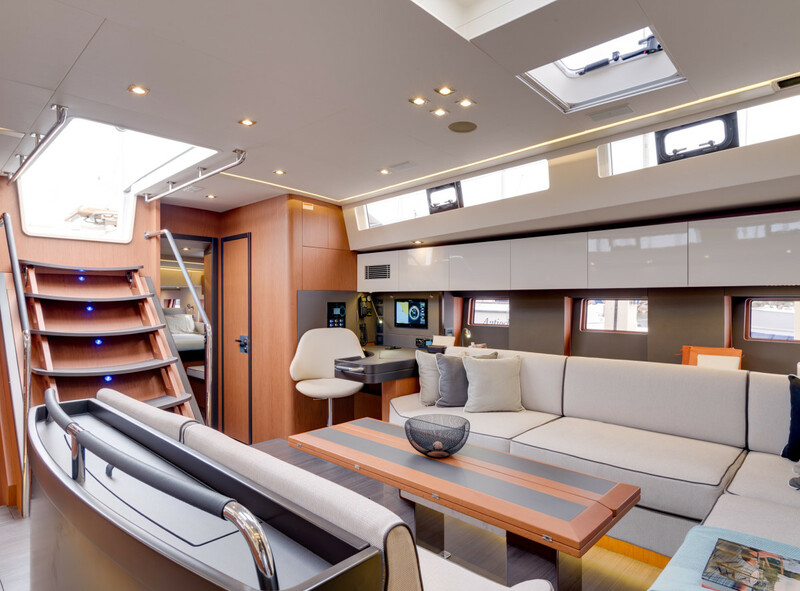 With the raised cabintop, there is 6ft 11in of headroom at the foot of the bed, and the whole suite is light and bright due to the twin opening overhead hatches and the rectangular hull windows that you can see out of from bed. Beneteau also added two transom hatches that provide light and air to the aft cabins. When seated in the saloon, you can see all the way aft and out the back of the boat, which further accentuates the sense of spaciousness and length. That said, the trip back there on hands and knees to open or close these hatches is not an easy one, and I suspect many guests will also pile their luggage and clothes there, negating the effect. A cabin can be added to starboard, but eliminates the head and shower compartment there. Aesthetically, Beneteau has borrowed some touches from its high-end motoryachts to up the ante on the finish. Brushed oak or mahogany Alpi wood, for example, are combined with numerous fabric-topped and leather-wrapped surfaces. Indirect lighting and leather cabinet pulls are also everywhere. 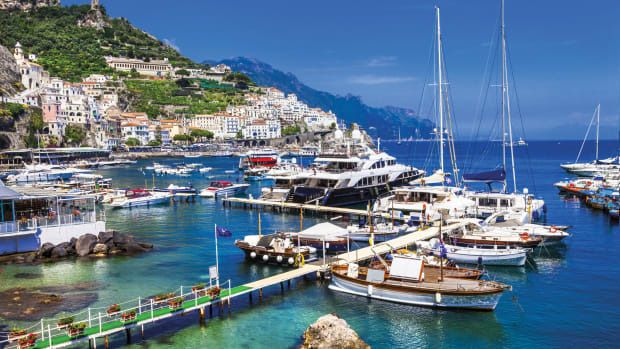 These small touches signal that the Oceanis line is about luxury and choice, providing the owner with numerous opportunities to personalize and upgrade the vessel and consequently the entire onboard experience. We popped out of the river at Les Sables-d’Olonne, France, on a cloud-covered windy day that showed a small Atlantic swell and a 3-4ft chop. At a 55-degree apparent wind angle (AWA) in 16 knots of true wind, our Incidence-built sails carried us along at 8 knots, which jumped to 10.2 knots when we eased off to a beam reach. Falling off even further brought us 10.4 knots at a 140 degree AWA. I admit I may have been driving when a large wave slapped the hull just forward of the beam, dousing much of the cockpit and everyone in it. However, no one (well, almost no one) seemed to mind as we noticed that the boat just shouldered the hit and kept on pushing forward as if nothing had happened. We motored along at 8.5 knots with the throttle set at 2,000 rpm, where the Beneteau Oceanis Yacht 62 burns about 3gph. An even better cruising speed was 6.5 knots and 1,400 rpm, where fuel consumption settled in at just over a gallon per hour.  It’s always exciting to step aboard a brand-new model, because you get to see, feel and try out a boat that has previously only been on the drawing board. 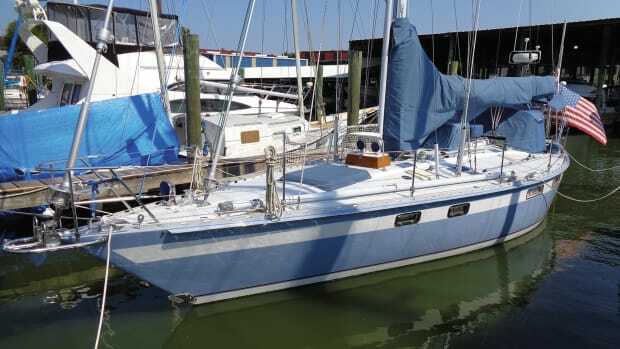 Along with the product development team, I was able to spend eight hours inspecting every nook and cranny, and it should come as no surprise that since the day of my sail trial the boat has been selling like hot cakes.